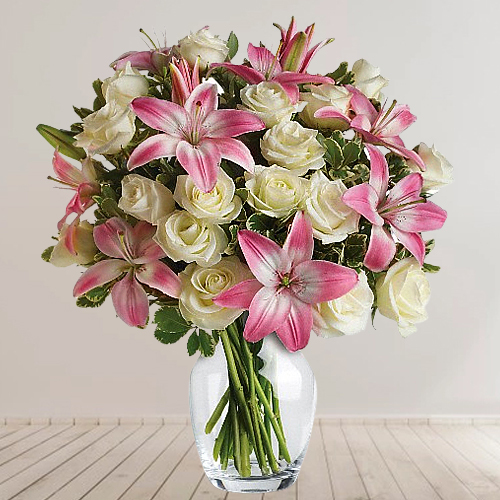 Pamper your loved ones by sending them this Breathtaking Present of 8 Pink Lilies with 15 White Roses in Glass Vase exclusively meant to convey your wishes in the best manner. Note: As per the availability design of vase may change. Flowers Delivery Firozpur, Send sweets Trichy, Wedding Cake Vapi, Diwali Mithai Anand, Send Flowers and Gifts to Tirupur, Online Shop Gulbarga, Flower to Valsad, New Year Flowers Delhi , Fresh Fruits Nadiad, Send Gift Rajkot, Dry Fruits to Kolhapur, Birthday Delivery Krishnagiri, Sending to Coimbatore, Flower shop Jaipur, Bilaspur Online Cake Delivery.